In March, the label Culture Power45 will release the vinyl record “Prolific Hits 3” of Infinito 2017 AKA Marcellous Lovelace. It’s therefore an opportunity for me to question him about his Art. You were born in Chicago, in the year of 1975 then growing up there. At 13, during the summer of 89, you realized you wanted to be an MC. Who were your first Hip Hop influences? – I actually started freestyling Hip Hop raps, writing graf and B – Boy / break dancing when I was 10 years old. The first songs I was able to record on a tape deck were made when I was 12 years old. Freestyling was just like writing graffiti to me because it was just free flowing styles and expressing self. I never intended to create my art forms for others, mostly everything you see me do and release to the public is my personal expression. The worst feeling in the world to me is collaborating with others who do not share in my spirit or my views because it distorts my expression in its totality. I’m a free spirited thinker and I think all people should only express for themselves first and if someone else likes it then that’s cool too. My first influence was my cousin Fatnice and my Uncle Pat. Fatnice is still one of the best Hip Hop Emcees to me and Pat was a Dj who schooled us on Run Dmc, Grandmaster Flash and BDP etc. Some of my early influences were KRS ONE (BDP), Chuck D (Public Enemy), Ultramagnetic Mc’s, Busy Bee, Jungle Brothers, Run Dmc, Stetsasonic, Gangstarr, Just Ice, Fat Boys, Dj Pete Rock, Brand Nubians, Son Of Bazerk, Kool Herc, X Clan, Rock Steady, Kase 2, Skeme (Writer), Style Wars move etc ..Many more from this generation taught me the lessons. I grew up on positive love of self and kind! In the early 90s, you were forced to move in Fort Knox, then Memphis. At this time, you disliked these places. What the subject matter of your Art (as a lyricist and a painter too) in this hectic era of your life? My music and art have always been personal creative expressions. I never use outside influences as ways to create my own art. I never thought no one should bite, copy or clone others. No one should have the same voice or cadence styles. My subjects are normally based on the moment of self awareness; I’m using myself as a reference of understanding. When I and my late cousin Shon (LDP) first started recording Nelson Mandela was being released from prison, Apartheid was a major crisis on stolen land in Southern Africa (Azania), Ronald Reagan / Bush destroyed Black America even worse then what Nixon and others had. These were my topics in the 80’s early 90’s. Most of my Black art and Black Cartoons, Black books etc consisted of these topics as well. I never create from another person’s view point I just create from experiences and my life’s understandings. If you research my black art, black music, black books, black movies and other ethereal creative expressions you will learn I’m a documentarian who is writing my biography. 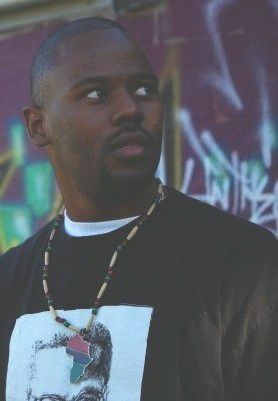 LDP stands for Lamont (My middle name) and Dariel’s (Shons Middle name) Posse, Shon passed away in the 90’s he is the son of my Uncle who is the Nephew of Frank (my independent label dedicated to my family after my cousin Shon died from senseless violence in Chicago). Also Pat is one of his mothers brothers. My independent label Joe Left Hand Records is a label dedicated to my late Uncle Joe Lovelace who is a left hand Scorpio like myself who was a creative soul. In the 2000s, you are in your peak of productivity. Some years, you’re able to record like 10 albums. In this decade, who are the producers and other Hip Hop artists you have worked with? I normally created up to 25 to 30 albums a year from 1999 to 2017; you would have to do in-depth research to find all of my aliases, no person on earth has ever been able to find them all. I have created albums using over 25 monikers. This is more because I’m introverted on purpose, too much of the wrong energy hurts and serves no purpose. The producers are to various to count but it was mostly Memo from the Molemen, Dion Brown (COOL D), Fatnice, Mr. Skurge, Mixx Massacre, Thaione Davis, Insight and many more. I released over 400 records during this time. I have over 17 different albums coming out this year. By the way, in view of your astronomical number of recordings, how did you proceed to select the tracks on the “Prolific Hits 3” project? I wanted to release some of the songs I liked to perform the most on vinyl because they have never been on vinyl. Prolific Hits 3 is just a continuation of me being consistent in my life, void of others viewpoints. My music is my heart in audio format. Did you already come in France? I hope we get a chance to see you here on stage! Who would you like to thank for the release of Prolific Hits 3 and more generally for your artistic journey? I’d like to thank my Father rest in Peace, My Mother and My Grandmother. These people are the only support system I have on earth and they always helped me have a space to create without limits. No one helps me make music in any consistent way, many people try to use me, it’s truly a personal solo consistent quest and I love it like this alone! I spend more time creating than anything else on earth. Never Waste time or share space with those who have nothing useful to offer. You can pick up the vinyl and other releases from www.culturepower45.com also visit www.joelefthandrecords.com / www.infinito2017.com to get other Infinito 2017 and Crew collection. Wish his new record “Prolific Hits 3” being succesful.